Eight small cups and one big kiddush cup, this delightful hammered textured Kiddush fountain is by Yair Emanuel. Silver plated and with matte silver bands around the slightly tapered bottoms of the cups, this fountain is a wonderful design for a gift or your own home. 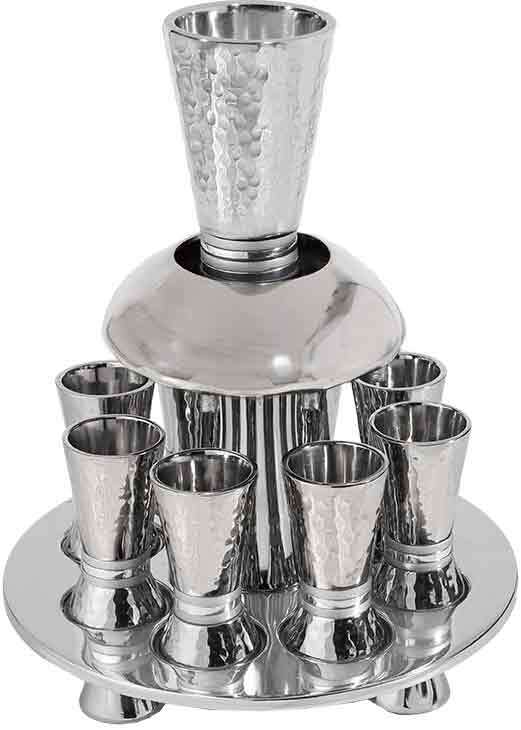 With a big main kiddush cup on top, and eight small kiddush cups in a circle along the base, this wonderful Kiddush fountain is silver plated, hammered textured and features matte silver stripes around the bottoms of all of the tapered cups. Yair Emanuel's judaica art is creative and modern and this design is no exception, a wonderful design both as a gift or as a new piece for the judaica collection in your own home, to make your kiddush experience and shabbat table more special and interesting. The fountain contraption is right under the main kiddush cup so one the blessings are said, some of the wine can be poured down the fountain and into the small cups to share with the family and/or guests around your shabbat table.